Phoenix Sky Harbor International Airport was named one of the best airports in the country for corporate travelers, as per TravelBank. The company, which makes travel and expense system software for businesses evaluated five factors in this inaugural ranking – on time arrivals, airport transit, parking prices, quality and service and average hotel price to determine its list. Combining all these factors, Sky Harbor came in at number three. 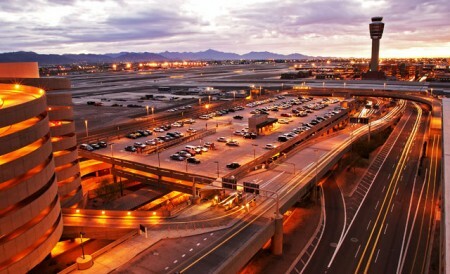 Sky Harbor (PHX) was in the top three for transit and scored a high J.D. Power ranking, which is how TravelBank had ranked quality and service. Phoenix had a high on-time arrival performance at 83 percent that is an additional quality for the airport. TravelBank had also noted the number of high-quality restaurants in the Phoenix airport. Duke Chung who is the founder and CEO of TravelBank feels that business travel need to be a stress-free experience and that when a flight fails to arrive on time or an airport lounge does not include basic amenities or strong Wi-Fi connectivity it can negatively impact the entire trip. TravleBank’s report also listed the five worst U.S. airports for business travel. They include Los Angeles International (LAX), San Francisco International (SFO), New York John F. Kennedy International (JFK), Newark Liberty International (EWR) and the worst was New York LaGuardia (LGA).